Now that we’ve got that out of the way, let’s learn about the magical world of stoichiometry! How can we do simple calculations? One time I was making sandwiches for some of my son’s friends who had inexplicably been invited over to my house on a “playdate”. All I had was crackers and cheese in the house, and the kids all decided that the proper way to eat them was to put one piece of cheese between two crackers to make a little sandwich. It’s a miracle I didn’t kill any of them. If I have 20 crackers and assume that I have infinite quantities of cheese, I can make 10 cracker sandwiches. The fat kid had to go home because he threw up. Stoichiometry is a set of calculations you perform to figure out how much stuff you can make in a reaction, or how much stuff you will need to make the reaction occur. In other words, stoichiometry is used to figure out if you’ve got enough crackers to make 30 sandwiches, or how much cheese you’ll need to make 15 sandwiches. Of course, since chemistry uses fancy symbols, we’ll deal with all of that in a second. However, that’s the basic idea. Example: Using the equation 2 H2 + O2 →2 H2O, determine how many grams of water can be formed from 45.0 grams of oxygen and an excess of hydrogen gas. The box that says “grams of what you’ve got” refers to the number of grams that you’ve been given in the problem. In our example, we literally see “45.0 grams of oxygen”, so that’s where we start. The box that says “moles of what you’ve got” means that before we even start talking about water, we’ve got to figure out how many moles of oxygen we have. Since you already know how to do mole calculations (using the molar mass of what you’ve got, shown above), you should be OK. The box that says “moles of what you want” refers to the fact that, using the equation for this reaction, you can convert “moles of oxygen” to “moles of water.” We do this using the mole ratio, which literally just consists of the numbers written down in the equation. We’ll get back to that in a sec. The box that says “grams of what you want” refers to what is likely your desired answer. To get this value, convert the moles of water to grams of water using water’s molar mass. When you’re finished with this, you’re done! Step 2: Put whatever the problem tells you in the top left of the t.
In this case, the problem tells you that you have 45.0 grams of oxygen, so write “45.0 grams of oxygen” in the top left of this t.
Step 3: Write the units of whatever was in the top left at the bottom right. Since “grams of oxygen” was written at the top left, write “grams of oxygen” at the bottom right. Step 4: Write the units of whatever the next step is on the top right. Step 5: Put numbers before each blank on the right side of the t, corresponding to the conversion factors you need. Step 6: Repeat these steps until you’re done. You’ll get the hang of what to do before long, but I’ll keep going through all of these steps in this example to make sure you’re comfortable with the calculations. Step 8: Write the units of the thing you want to find in this step in the top right. Step 9: Add the conversion factors in the blanks on the right. Now, given that we have “moles” on both the top and the bottom, it doesn’t really make sense to put “1” in each spot as we usually do. Instead, realizing that the equation gives us a ratio of the number of moles of oxygen to number of moles of water (these are the coefficients in the equation), we’ll put these numbers in front of each number. This ratio is called the “mole ratio”, because it’s a ratio of moles. Step 10: Do the last conversion from moles of water to grams of water, using the standard t-chart method. And that’s how you do stoichiometry! Of course not. But it’s all for now, so you’ll have to wait for limiting reagents to find out more. Stoichiometry: A PowerPoint presentation put together by one of the talented users of this site, Krista Vinson. Crash Course Chemistry: Stoichiometry: Once again, Hank Green gives us an excellent video regarding chemical awesomeness. Introduction to Stoichiometry (Ben’s Chem Videos): He may not have made a big production out of this, but it’s got everything you need in detail. How to Solve Stoichiometry Problems With a Conversion Box (chemgirl): This is similar to what’s on this site, but has a slightly different angle. Helpful if you’d like another viewpoint than the one I’ve presented. The other question: Did I really care? No. For the record: He didn’t cry because he was fat. He cried because he was a crybaby. 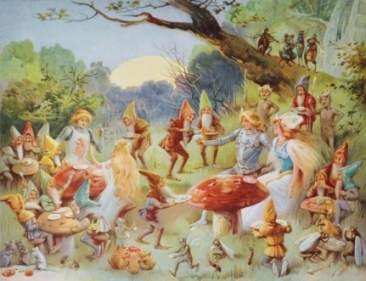 Magical land of stoichiometry: By E. Stuart Hardy (illustrator) [Public domain], via Wikimedia Commons. 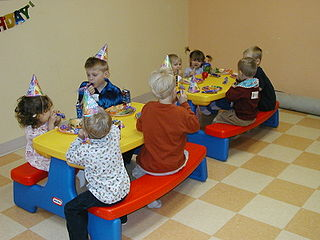 Party sans fat kid: By D’Arcy Norman from Calgary, Canada (Flickr) [CC BY 2.0 (http://creativecommons.org/licenses/by/2.0)%5D, via Wikimedia Commons. Note: This isn’t actually the party in question. Unfortunately, my son’s friends are too ugly to photograph. All the t-chart stuff is all mine. Check out my mad Paint skills! For those of you who have been told to cite things incorrectly, the date this was published was February 2, 2015. If you’d like to do it the right way, Google “ACS Style” or the style rules for any of the other physical sciences. Seriously, MLA style? That’s only used in the humanities, and we’re scientists!